Get more Spoon in your feed. You tryna be tricky? That email doesn't look right. It’s no secret that college students (and everyone else) are fueled by caffeine of some sort. Not only is America the biggest consumer of coffee, a whopping 83% of adults drink this morning staple. It’s no surprise that the most economical way to be a daily coffee-drinker is to learn to brew it yourself. If you “only drink coffee from Starbucks” I’m going to have to stop you there. No, you can’t walk 2 blocks without seeing a Starbucks on either side of the street but is it really your favorite? Go around the corner and try out these other (arguably better) independent coffee shops. We promise Starbucks will be there when you get back. If you haven’t made your way to MacDougal and W 8th St yet, you should probably start walking there now. The laid-back atmosphere and hipster vibe will give you a moment of peace from the busy day, and the friendly baristas will greet you with warm smiles and your favorite caffeinated beverage. Get there early, if you want to snag a seat and table to meet up with a friend or get some studying done. They also have lots of vegan treats and sometimes a gluten-free one too! There is also a Brew Bar right next door, open from 9am-5pm daily for all your coffee-without-milk needs. Best of all? They make a perfect soy latte. *Pro Tip: There’s almost always a film crew shooting right outside, maybe this will be the coffee gateway to your time on the big screen? Next time you have an extra $5 in your pocket, head on over to Third Rail. This cash-only coffee joint, tucked on the corner of Sullivan and W 3rd St, is worth the short stroll only one block south of Washington Square Park. With a similar vibe to Stumptown, Third Rail is a cozier space and can get a little crowded at peak coffee times, but does offer some seating and small tables. Joe Coffee is another cool spot right on the border of West Village. Tucked away on the corner of Waverly and Gay St, Joe offers plenty of indoor and some outdoor seating with a warm and welcoming environment for you to unwind with a book or meet up with a friend. You can even take latte art classes and other coffee workshops at their “pro shop” on W 21st St.
With it’s convenient location on Waverly between University Place and Greene, you can satisfy your coffee needs on the way to and from class. Be warned, the convenient location means extra long lines that can leave you standing in or outside the door! With only a few stools, this is not where you want to go for a sit-down cup of joe. If you’re walking to class or to or from Soho and find yourself on Lafayette between Bleecker and W 3rd, pop in to Mille-Feuille. This intimate coffee shop features all your favorite sweet treats and they don’t slack in the coffee department. It’s normally pretty quiet, making it a great place to grab something quick, get some work done between classes or meet a friend. If you’ve got some time and money to spare they also offer baking classes! 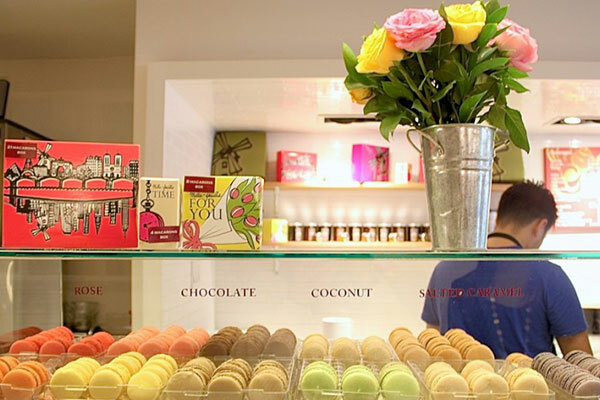 From croissants to French macarons, what more could you ask for? So next time you’re craving your favorite type of coffee on-the-go, whether it be a shot of espresso, a macchiato, soy latte or drip, put your Starbucks gold card away and try one (or all) of these sweet spots. Why wouldn't you order from somewhere that puts french fries ON the pizza? Beating the clock without breaking your budget.